The pickup truck has been America’s bread and butter for a very long time now. Typically they are used by farmers, construction workers, and anybody who needs a vehicle that can get any job done. The only thing a pickup truck couldn’t do in the 1990s was be “sporty” in the way it handled and accelerated. Oddly enough, Chevy thought it was a good idea to attempt to fill that sporty truck gap with their 454SS version of the Silverado. The 454SS is a version of the Silverado (obviously) that was only available as a 2WD half-ton, single cab, short bed. The only color that was initially available was Onyx Black with a polarizing red interior. The engine was a slightly hopped up version of the current 454ci big-block Chevy had in its production line. The transmission was a TH400 with a lower than standard 3.73:1 rear gear ratio to improve acceleration. The rear axle was unique in that it was a 14-bolt from a 3/4 ton truck, but with a 5 on 5 bolt pattern instead of the typically 8 lug pattern. Luckily Chevy didn’t just stick a hopped-up engine and special rear axle in the 454SS and call it a day. The exterior has a unique front bumper with fog lights that gave the truck a much angrier look. The bumpers, mirrors, and grille were all blacked out for a sinister Darth Vader-y look. Along the bedsides were arguably obnoxious 454SS decals with would probably look awful on a modern truck, but was acceptable back then. The 1990s was an odd time for American vehicles. Emissions restrictions were forcing manufacturers to release a vehicle with extremely low horsepower. The 305ci Camaro IROC Z only made 210 horsepower which is around 42 horsepower per liter. For comparison, the B16 engine used in Japanese Hondas in the early 90s was producing over 100 horsepower per liter. So when Chevy introduced the 454SS in 1990 with a hopped up version of their existing 454ci big block, it only produced 230 horsepower. It did, however, produce quite a lot of torque – 385 lb-ft to be exact. 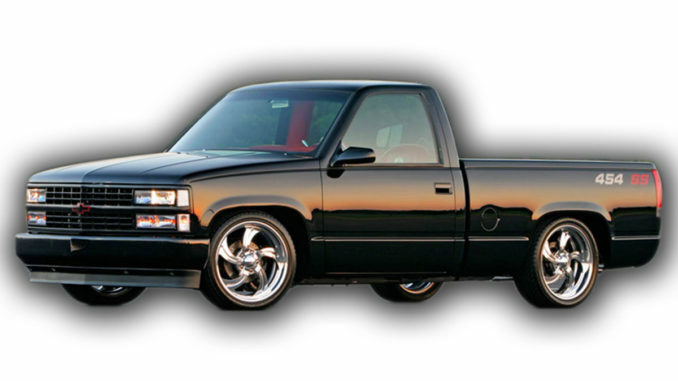 In 1991 the 454SS received the new 4L80E transmission with increased horsepower to 255 and torque to 405 lb-ft. Along with the increased horsepower was a lower rear gear ratio of 4.10:1 which improved acceleration. All of this combined pushed the 454SS down the quarter mile in 15.6 seconds which wasn’t too far behind the Camaro IROC-Z. In today’s standards, that kind of quarter mile is kind of disappointing, but you have to remember this is back when American cars we’re behind strangled by emissions standards. If you were to remove all the horsepower restricting emissions components, install a larger camshaft and aftermarket cylinder heads you could pretty easily produce over 400 horsepower. This kind of horsepower would push that quarter mile time down to the 13s which is actually pretty quick. The cool thing is with how large the Chevy aftermarket is, doing something like this would actually be super easy. Finding a 454SS to modify, however, may not be so easy. Unfortunately, Chevy didn’t produce very many of these trucks. They intentionally made the 454SS a limited edition vehicle for some odd reason even after decent sales in the first year. The first year 13k of these trucks were sold, but that number quickly dropped down to 1 – 2k in the following years. A grand total of just under 17k of these trucks were produced. We are very curious how a modern day reincarnation of this truck would perform in terms of sales. Power isn’t the only thing that makes a vehicle sporty and Chevrolet recognized this when the launched the 454SS. The suspension was upgrade with Bilstein shocks and a larger front sway bar. A larger front sway bar would generally increase understeer in most vehicles, but since this one sits pretty high it’s necessary just to make it feel sporty. The steering ratio was also much quicker which is a major factor in making a vehicle feel sporty (look at the Fiesta ST for example). To summarize all this: the 454SS is pretty pathetic in modern day standards, but back in the 1990s it was pretty impressive. It was powerful, stopped well, handled well, and looked pretty sinister. Today’s single cab V8 trucks would run circles around the 454SS, but that makes us wonder what a modern day Silverado SS could do. Something like an LT4 650 horsepower Silverado would be pretty sweet. Great article! I’m a big C10 fan, but the 454SS has always been a little out of my reach. have the 1990 chevy sport truck can you tell me the differents.